SAAM: Do You Know What a Healthy Relationship Looks Like? Do you know what a healthy relationship looks like? 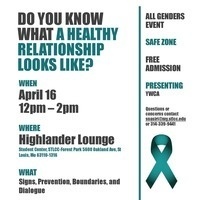 Join SGA for a "lunch and learn" presentation in the Highlander Lounge.